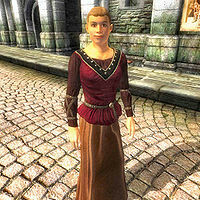 Ida Ottus is an Imperial commoner living in the Temple District of the Imperial City. Her parents are Hastrel Ottus and Alessia Ottus. She and her parents are devout temple worshippers. She occasionally makes trips to Anvil, where she will stay at The Flowing Bowl. Also when in Anvil, she will visit the Chapel of Dibella, but she is more interested in Mara (while Hastrel prefers Akatosh). Ida Ottus wears tan linens, a burgundy linen shirt, and a pair of doeskin shoes. She also carries her house key and a moderate amount of gold. She will introduce herself with, "My name is Ida Ottus, and I'd like to talk about Mother Mara." If you ask her about the Imperial City, she will say: "Mara's blessing on you, and on all her children. Speak to her at the Temple of the One. Ask Mother Mara; she will shower your heart with love." Ida has a complex schedule compared to the average citizen. On Morndas and Middas she starts her morning at midnight, where she exits the house and heads over to The All-Saints Inn. She wanders around the inn for eight hours. At 8am she leaves the inn and heads home, where she will enjoy a two hour breakfast (usually a mug of cheap wine). After breakfast she will exit the house once more and spend two hours walking around the Temple District conversing with other citizens. She will end her walk at noon and return home and explore the ground floor of her house for five hours. At 5pm she will have a one hour supper (usually another bottle of wine), then she will stroll up to the private quarters and sleep for six hours. On Tirdas, Turdas, and Fredas, after her breakfast she will leave at 10am and walk through Green Emperor Way and head for the Market District. Upon arrival at 11am she will spend the next six hours wandering around, occasionally stopping to speak with her fellow citizens. At 5pm she will head home back through Green Emperor Way. She will arrive home at 6pm, where she will skip supper and head to the private quarters to sleep for six hours. On Loredas and Sundas, instead of going to The All-Saints Inn, she will instead head to The Bloated Float Inn where she will wander from 1am to 8am. She will then leave the floating tavern and head home to enjoy her two hour breakfast at 9am. After finishing breakfast on Loredas, she will walk around the Temple District to socialize for two hours before coming back home (on Sundas she tends to skip the walk). She will then wander around the ground floor of the house for four hours until her 5pm supper. After a one hour supper, she will retire to the living quarters where she will sleep for six hours. The exceptions to this schedule are as followed. On the 28th of each month at 1am she will head to Anvil. She crosses the Talos Bridge and heads south on the Red Ring Road before finally heading west on the Gold Road while doing her best to avoid the wildlife near the many Ayleid ruins and caves. She reaches the famous vineyards near Skingrad after twelve hours of traveling and finally reaches Anvil at 5am the next morning. Once there, she heads down to the dockside and enters The Flowing Bowl for two days of drinking and chatting with the pirates and regulars. She will depart from Anvil on the 30th at midnight and will arrive back in the Imperial City at midnight a day later. During the quest An Unexpected Voyage instead of boarding The Bloated Float, she will stand on the dock where the ship usually is and at the appropriate time she will continue with her schedule. During the quest Light the Dragonfires she will be confined to her house like most other Imperial City citizens. Esta página foi modificada pela última vez à(s) 05h30min de 20 de outubro de 2015.